It’s time to get ready for the new season and build your registration. You may be new to the process, or it could be that you just need to brush up on a few parts of the registration process. TeamUnify is here to help you build the right Online Registration for you and your team. Before we jump right into the setup, it is a good idea to take a look at a few other areas of your TeamUnify site first. If you feel comfortable with Credit Card Processing, Billing Groups, Payment Options and Roster Group set up and believe they are all correct, please skip to Step 2: When To Clone Your Registration, but if you are new or want to freshen up let's take you through Pre-setup for Online Registration. TeamUnify gives you the unique ability to leverage automated electronic payment processing system with your Online Registration. Taking away the confusing and paper-filled steps of collecting and recording cash and check transactions. Helping you to realize vast improvements in cash-flow and a quicker and easier Online Registration. In order to use electronic processing, you will need to apply and be approved by C & H Financial Services. TeamUnify has partnered with C & H Financial Services to deliver the most secure payment processing possible for your team members. If you are a seasonal team that already has Credit Card processing, C & H Financial will automatically reactivate it. For any additional information on Electronic Processing please visit our Knowledge Base on Electronic Processing. Before the registration process can be set up in its entirety it is important to set up all of the billing Chart of Accounts (CoA) properly. Click Billing Admin > Billing Setup. Click the CoA Setup tab. There are a few generic accounts that are automatically set up by TeamUnify, please remove and/or add any accounts that match your accounting and/or QuickBooks needs. Seasonal teams generally find the default accounts useful. Year-round teams should check w/ their Accountant, esp. if using QuickBooks, and set up accounts as desired. For additional information on CoA setup please visit our Knowledge Base on Chart of Accounts Setup. Billing groups, Sub Billing groups, Roster Groups and Locations can all be used to track information, separate your teams, and set up recurring billing. Not every TeamUnify team uses these functions, but this information can be gathered using the Online Registration process. Generally, seasonal teams need just one item in each of those four areas. If you would like to run billing cycles and the Billing Admin side-menu does not appear on your site you must notify billingactivation@teamunify.com to turn on your billing system. Once your billing is turned on, use this Quick Guideto help get your system ready for billing on the 1st of the month. If you are a seasonal team and only need a simple set up, follow these steps. Click Team Admin > Team Profile. Scroll down the page and click Setup Billing Groups/Roster Groups/Locations. 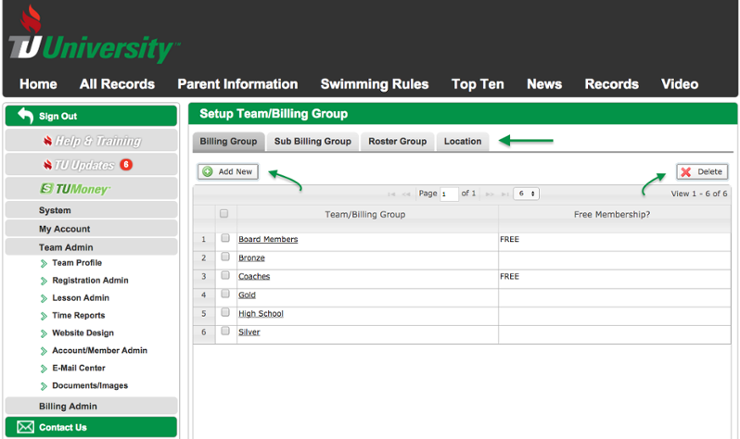 Billing Group — Add "Swim Team"
Sub Billing Group (if applicable) — Add "Full Payment"
Location — Add "Swimming Pool"
For any additional information on Billing Groups please visit our Knowledge Base on Billing Setup. 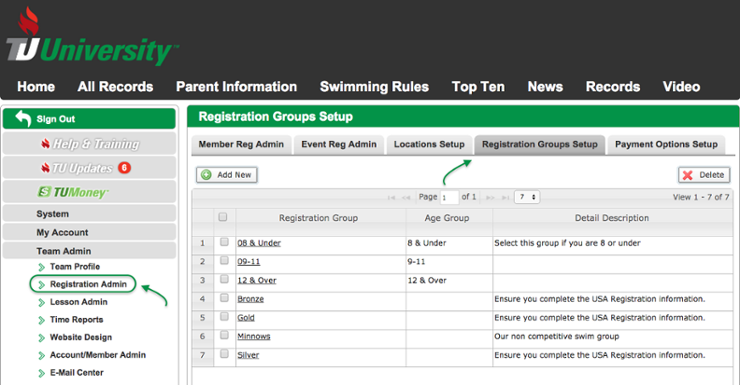 Registration Groups are an essential part of the Online Registration process and allow you to define which Roster Groups your Parents/Accounts want their swimmers to be in and how much that registration costs. This can be a simple or as complex as your team needs. If you have set up multiple Roster Groups and run different practice sessions or age groups for your team, setting up Registration Groups gives parents the ability to sign up their athletes up for their desired session or time. If you only need a simple registration and have just a single roster group follow the steps below. Click Team Admin > Registration Admin > Registration Groups Setup tab. Enter a Registration Group Name. If you are going to Enforce Age Groups in your registration or if you would like to let parents know what the normal age range is for this Registration Group, please enter an Age Group range. 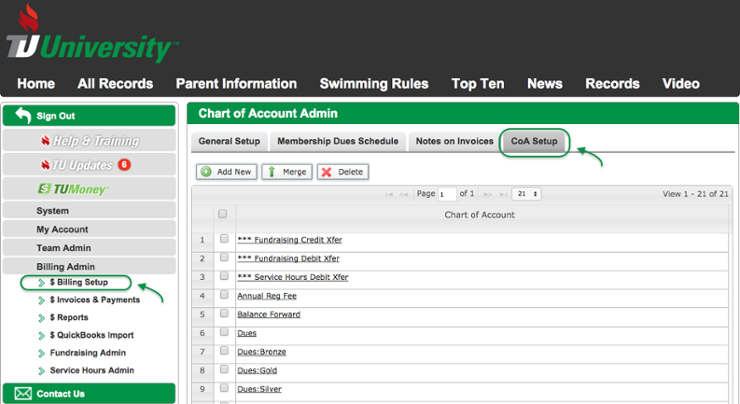 Description is what a Parent/Account will see when registering a Member/Athlete. 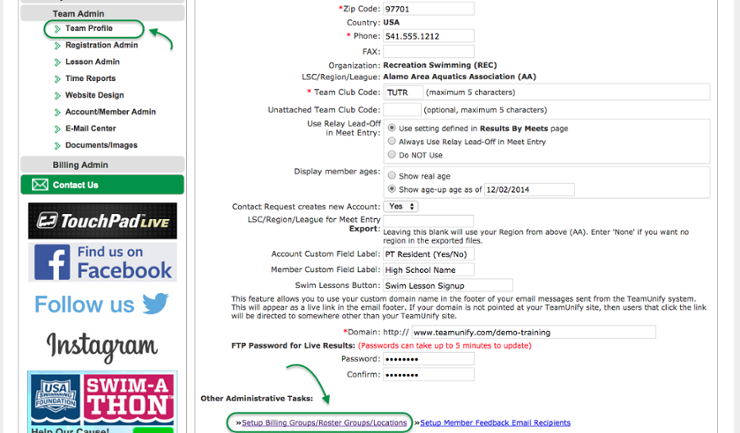 Save Changes and add any other Registration Groups your team may need. For any additional information on Registration Groups please visit our Knowledge Base on Registration Groups. Now that you have set up and gotten comfortable with a few of the areas that will affect your Online Registration system let's continue and check when to clone your registration.